There is nothing more important to your child's well-being than a healthy digestive tract and maintaining a healthy immune system. Your child's digestive tract is home to billions of probiotics - friendly bacteria that aid digestion and support their immune system. Today's modern lifestyle and diet can affect the balance of bacteria necessary for healthy digestive function. Probiotic supplementation increases the amount of beneficial bacteria, helping support this delicate balance in the gastrointestinal tract. For generations, parents have relied on raw foods as cornerstones for their children's diets to provide the live probiotics, prebiotics and enzymes necessary for healthy digestion. Given today's modern lifestyle, it is more important than ever to include digestive support in your child's daily routine. 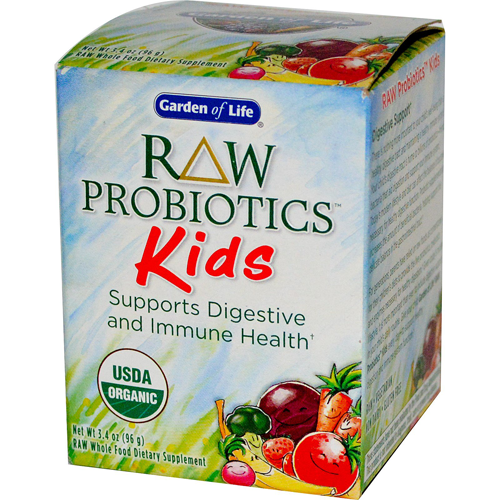 Give your child Garden of Life Raw Probiotics Kids every day to support healthy digestion and immune system function. Raw Probiotics Kids ia an organic, whole food probiotic formula specifically designed to meet the unique needs of children. Formulated with powerful probiotics, 23 raw and organic fruits and vegetables, plus raw inulin - a prebiotic that supports probiotic growth - Raw Probiotics Kids delivers over 5 Billion live probiotic cells per daily serving. 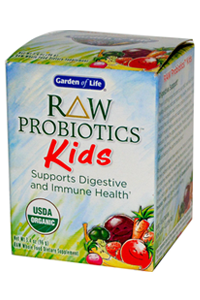 Garden of Life Raw Probiotics Kids features Garden of Life's 'Arrive Alive!' Potency Promise. Utilising temperature-controlled cold storage and delivery from the moment the probiotic cultures are harvested all the way to your refrigerator - you can be certain they are fresh, alive and body-ready. For children 3 months and older, start with ¼ teaspoon daily and gradually increase to full serving of ¾ teaspoon daily or use as directed by paediatrician. May be mixed in infant formula, milk, water, juice or sprinkled on food such as yogurt, apple sauce or cereal. Contains no fillers ingredients, artificial colours or preservatives. As with any dietary supplement, consult your healthcare practitioner before using this product, especially if you are pregnant, nursing, anticipate surgery, take medication on a regular basis or are otherwise under medical supervision. Do not use if safety seal is broken or missing. Keep out of reach of children. Store in a dry place at 71°F (22°C) or below. Best if refrigerated. Packaged by weight not volume. Settling may occur. *At end of Best Use Date under recommended storage conditions.